1. Pool water gets murky almost immediately. 2. Pool water smells very strongly of chlorine all the time. 3. Water is visible surrounding the pool pump or filter tank. 4. Filter or pump are making strange noises. 5. Pipes and other pieces look rusty or damaged. 6. The pump is overheating with no visible reason why. 7. Bottom or sides of the pool are starting to peel or flake into the water. 8. The pool is losing water too quickly. 9. Sand or diatomaceous earth are getting back into the pool from the filter. 10. Water continues to test for poor pH balance or for contaminants. Do you operate a commercial-grade swimming pool? Do you have a residential swimming pool that gets used very frequently and could benefit from a commercial level of filtration? Are you looking for the perfect way to keep a larger pool well-filtered and clean all year long? If so, you need a commercial pool filter to help you get started! Commercial swimming pool filters are a great way to be sure your pool gets as much filtration as possible regardless of how frequently it gets used. When you have a large pool that sees a lot of use on a daily basis or even a mid-sized pool that gets used several days out of the week, you need a filter that can handle the amount of wear and tear your pool is sure to see. Commercial pool filters pose their own series of concerns, and in this article, we’ll introduce you to the similarities and differences between these and residential pool filters. You’ll also be able to learn more about the issues you’re likely to encounter when using your commercial pool filter. Later on in the article, you can compare and contrast our top three picks for commercial-grade filters on the market today. Whether you’re looking for commercial sand filters for swimming pools, cartridge filters, or even commercial DE filters, you’ll be able to find just what you need from our list. So, let’s get started learning more about commercial pool filters. There are a few differences as well as similarities you’ll need to consider when you’re looking into commercial pool filters. Whether you choose to use one of these filters on an actual commercial pool or you want to use one to give your residential pool an added boost of filtration, you’ll be able to see for yourself why you might want to go this route—or why you might not want to, depending on your situation. Both types of pools use pumps to move the water through the filter media. Both types of pools can be filtered with cartridges, sand, or diatomaceous earth. Both types of pools run the risk of developing serious contamination issues without a strong enough filter in place. Commercial pools usually require more chemicals than residential pools do. Commercial pools usually have much more square footage of water that needs to be filtered than residential pools do—but not always. Cleaning a commercial pool can be very difficult, so the better your filter, the easier it will be to get this job done. Indoor commercial pools are a little bit less likely to become badly contaminated than outdoor residential pools. 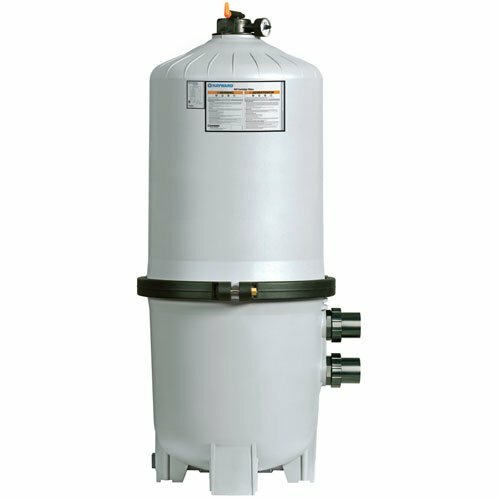 If you’re looking for a sand filter, you’re in the right place. Sand filters are a great way to provide excellent filtration for many years without having to worry about too much maintenance and upkeep. While you will be required to backwash a sand filter at least once a month, you won’t have to worry about cleaning out or replacing the sand in the filter until several years have gone by. Although these filters are a little more expensive to get started with, they can be very cost-effective in the long run. They remain one of the most popular choices for people looking for commercial-grade pool filters. 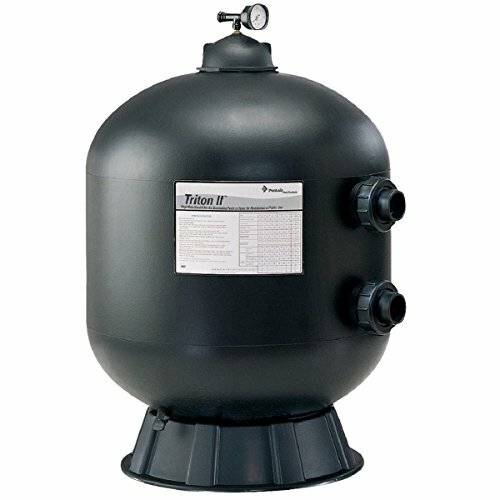 The Triton Heavy Duty Filter 30” Commercial Sand Filter is built to last. This is a very strong filter that looks sleek and sophisticated when you install it alongside any commercial-grade swimming pool. Although this filter doesn’t come from one of the better-known brand names in the pool industry, it’s still a very strong product that’s sure to give you plenty of years of excellent swimming pool filtration easily. Best of all, when you have it installed, you can keep using any pool treatment chemicals you need to keep up the pH balance of your water—but you might soon find that you don’t need them as much when you see just how clean and crystal clear this filter can get your water. This is a very strong and powerful filter that can handle a lot of wear and tear even if you keep it outdoors in inclement weather. The filter comes with a built-in base to make installation as easy and painless as possible. 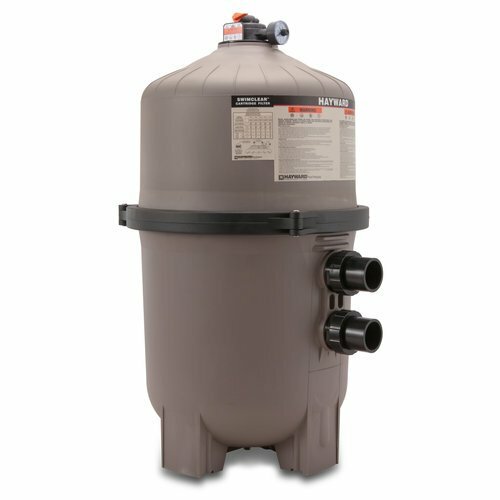 Sand filters such as this one are usually very affordable to operate after installation, and you shouldn’t need to replace the sand for at least a few years after you start using it. Backwashing is easy when you use the included valves to perform this task. This is a pricey filter that may cost too much at the initial setup for some commercial pool owners. This filter has been known to arrive with the pressure gauge broken during transit. In some rare instances, the filter’s seams have begun to weaken and developed leaks very quickly after installation. You will need to perform a monthly backwash cleaning on this filter to keep it up and running properly. If the sand filter doesn’t seem to suit your needs, you might be more interested in a cartridge filter for your commercial-grade pool instead. Cartridge filters are traditionally used for residential pools because the cartridge filter media often isn’t strong enough to handle a ton of filtration before it needs to be cleaned or replaced. However, with cartridge style commercial filters, you can enjoy all the benefits of a cartridge filter without worry since it comes equipped with four separate cartridges to keep your filter going strong for a long time to come. Best of all, you can even choose to use this type of filter with a microfilter to add even more filtration overall. Did you know cartridge filters can be a great way to provide ample filtration to your commercial swimming pool? You might not have considered this, especially if you’ve ever used cartridge filters in your residential swimming pool before, but if you have the filter you can get a lot of great, clean water time and time again even when you choose cartridges for your filter media. With the Hayward HCF7030C Polyester Commercial Dual Quad Cluster Cartridge Filter, you’ll never again have to wonder about how clean your water is. You’ll be able to rest assured knowing that you’re filtering your water as well as possible all with the help of your durable, powerful filter. This filter is made of polyester, which is very strong and resistant to both inclement weather and frequent splashing from the swimming pool. This is one of the largest square footage filters available today, and it’s capable of handling up to 700 square feet of filtration easily. Despite its power, this filter is tall and thin, which makes it fit into just about any commercial swimming pool setup easily. The filter comes with attached valves to make cleanup even easier. This is a very expensive product that’s at least twice the cost of many other commercial-grade swimming pool filters on the market today. This filter has been known to arrive with damage from transit. You will need to give this filter quite a lot more time to complete a cleaning cycle than you would with a smaller and less powerful filter. Although the filter comes with four cartridges to get you started, you’ll probably need to upgrade them to better quality cartridges pretty quickly, which may cause you to incur even more cost. Last but definitely not least, diatomaceous earth filters continue to be popular choices for commercial pools that need a little extra help in terms of filtration. These filters are usually the most expensive on the market, but since they only require a little bit of DE added back into them monthly after the initial setup, they remain one of the more affordable options in the long term. These filters work very well and are capable of filtering your pool water much more effectively than other types of filters. However, some people are concerned with the potential health risks of diatomaceous earth, and many places are beginning to regulate the dumping and flushing of these filters since DE has been known to have adverse effects on the environment. The Hayward DE4820 Pro-Grid Vertical DE Pool Filter is an excellent choice that comes from one of the best-known brand names in the world of swimming pool filters and other components. This is a traditional grid-style diatomaceous earth filter that works just like its smaller counterparts, but it’s large and powerful enough to handle even the biggest and most frequently-used commercial pools, too. It’s available in several different sizes to help you find exactly what you need for your pool, whether you need something smaller like a 24-square-foot option or something as big as a 72-square-foot filter instead. Best of all, the filter comes with a built-in diffuser to make sure water reaches all of the surface area of the filter media instead of focusing on one or two parts of the grid. Since this comes from the Hayward company, you can expect a great quality product with tons of quality customer service and care to back up that name. When you have this filter installed, you won’t have to worry about changing the DE very often, and will only need to add a little back each time you backwash. It only takes about one 24-hour cycle for this filter to clean up even the filthiest of murky swimming pool water. These filters are built to last for at least five years, and many people get seven to ten years of use out of them easily. While this filter unit comes with almost everything you need to get started, you will still need to purchase valve lines and o-rings to complete the installation process. This is a very expensive filter that may be too pricey for some commercial swimming pool budgets. You will need to perform backwash maintenance on this filter once a month in order to keep it up to par. Interior manifolds and the pressure gauge have both been known to arrive broken and damaged from shipping, although the company will replace these parts if this happens. Whether you’re operating your commercial pool as part of a hotel or another type of business or you’re just planning to install one in your backyard for personal or neighborhood use, there are a few different issues you’re likely to encounter throughout the life of your pool. In this section, you’ll be introduced to the most common problems commercial pool owners face on a regular basis. You’ll learn how to identify these problem areas and what can be done to prevent or improve them when the situation arises. By the time you’ve finished reading through this section, you’ll be ready to face whatever might be going on with your commercial swimming pool. This problem, also known as turbidity, usually arises from too many people swimming in the pool in a short amount of time. However, even if this happens, when you have the right filter installed, you can take care of the problem. You can recognize this issue easily simply by looking at your pool water. Even if your water looks clear enough but seems to have small particles floating in it, this means you need a stronger pump, a better filter, or both. When you can smell chlorine, that means it’s doing its job—cleaning up the contaminants in a pool. However, this also means the pool was very dirty, to begin with. While treating your pool with chlorine may be very necessary for most commercial pools, you can cut back on the amount of this harsh chemical you need to use by making sure your filter is strong enough for everything your pool throws at it. This almost always indicates some kind of leak. If you pay close attention to your filter and pump area, you’ll be able to notice water collecting around these areas before it gets too out of hand. If you notice this type of leak, you’ll need to repair, replace, or upgrade your filter or pump. There are many reasons that can cause this, and sometimes, they’re less of a problem than you might think. Don’t wait to get them checked out by a licensed pool technician. The longer you wait, the more damage you may incur. This usually happens because containers holding pool chemicals are left open for too long, causing the surrounding metal components to oxidize. However, in some instances, this can happen because of contaminants present in your pool water. This means you need a stronger filter to take care of the contaminants before they start to cause a problem. If you’ve checked out the pump well and can’t figure out what’s causing it to overheat so often, you might need to increase the air flow to your mechanical room. This can be done by cleaning out the vents more regularly or by installing more ventilation. This isn’t usually a problem related to the filter—but it’s always a good idea to inspect your filter first just to be sure. Normal wear and tear can cause this to happen, but too many contaminants in the water can also lead to this problem. Be sure you’re filtering everything potentially harmful out of your pool water to keep the surfaces looking great for a long time to come. Remember that a pool that sees a lot of use is bound to be exposed to harsher chemicals more frequently than other pools. There are several underlying causes of this issue too, but once again, the filter is a great place to start looking. If the filter is taking in too much water or if there’s a leak in the pipes, pump or tank, you’ll notice the pool losing water much more quickly than it should. Be sure to patch, repair, or replace any parts of your filter or pump system that might develop leaks so you don’t have to worry about constantly losing pool water. Any type of pool can experience this problem, and any sand or DE filter can potentially start feeding filter media back into the pool. This is usually a sign of a bigger problem, but it’s possible that you might just need to increase or decrease the pressure in the filter tank to resolve the issue. Be sure you’re using the right type of sand, DE, or filter media alternative for your specific filter, too. No matter how much you do to adjust the chlorine and other chemicals in your pool and no matter how many times you treat or shock it, sometimes you just keep encountering issues. This usually means that your filter or pump aren’t strong enough to handle the water flow in your pool. It may also mean that your pool is being used too frequently for your filter as well. This is a serious problem, as it can cause your pool to get shut down by the health inspector if you aren’t careful. This is quite possibly the number one reason why you need to be sure you’re operating the right filter for your pool at all times. Remember that, even though these may seem like a lot of issues to worry about, you can easily take care of all of these problems by having the right filter installed from the get-go. Even if you’re running a pool that’s been in place for a long time and you find yourself encountering one or more of these problems, you can remedy the issues for good by making sure you upgrade to a better, more powerful, and correct filter for your needs. Now it’s time to read on and learn more about the different types of filters available for you to choose from for your commercial swimming pool. As you can see, shopping for a commercial swimming pool filter isn’t exactly the same as buying a residential pool filter, but there are a few similarities that can help make the process go a little bit more smoothly. When you keep in mind the many troubleshooting issues you might discover when operating a commercial swimming pool, you’ll be able to figure out which areas you need to be more focused on when you purchase your filter. From there, it should be very easy to narrow down your options. Depending on the specific needs of your swimming pool setup, you might prefer to choose a cartridge style filter, a sand filter, or a diatomaceous earth filter. It may seem a little complicated to figure out the right filter for what you need to accomplish, but when you consider the frequency with which your pool is used, the amount of time you can devote to maintaining and cleaning the filter monthly, and the budget you have to spend at first as well as over time, you’ll be well on your way to making the right call. Remember that each of the filters mentioned here has its strengths and weaknesses, but you can’t go wrong with any of them. Pick your favorite and get ready for excellent and perfectly filtered water every time you use your pool!